Early morning in Koidu, Sierra Leone. In the year leading up to the trip, Stephen Ngaujah, a local pastor and trained nurse, worked tirelessly with LCMS missionary and nurse Stephanie Schulte to prepare the way for the team. Meanwhile, LCMS area director Rev. Gary Schulte and the Rev. Douglas and Angela Thompson — missionaries based in Sierra Leone — worked with the country’s national Lutheran church body on logistics. Before the clinic could be held, they scouted locations, secured medications and government authorizations, and visited with local chiefs and residents. The Rev. Gary Schulte (right) and the Rev. 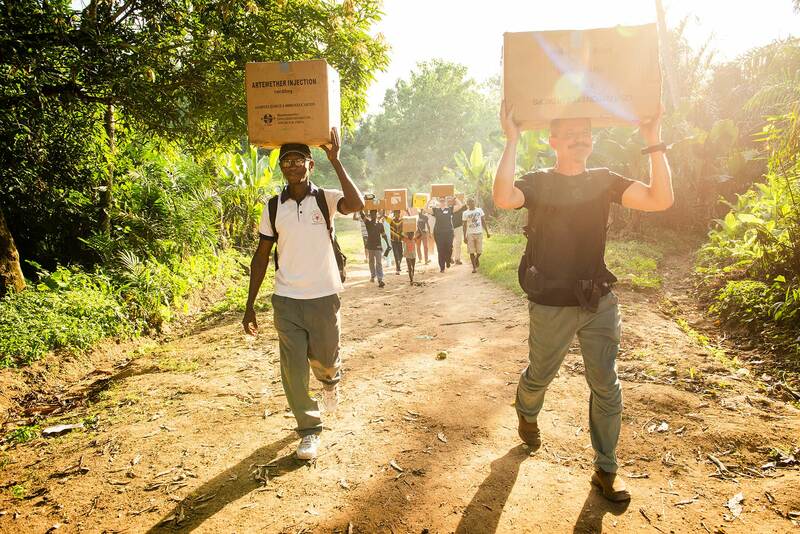 James Yasseh help the team carry medication to the village chief’s home for safekeeping during the night. Long before that, Fatmata was sick and in pain. She believed that Allah was cursing her for her wickedness. She believed she deserved it. She didn’t see any hope out of her situation from the hand of Allah. And yet she heard that people were coming to set up a clinic for medicine and care. And she hoped. Perhaps she could receive some relief. 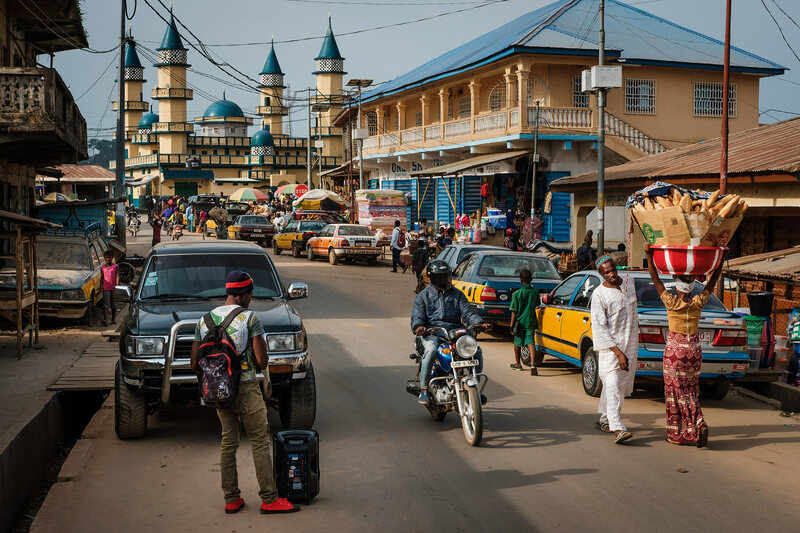 The people in the village of Yardu, outside the predominantly Muslim city of Koidu in the northeast corner of Sierra Leone, anticipated this team’s arrival. News spread of people from America with medicine and skills and relief for suffering. Some walked miles to the clinic, such as those who came from the Lutheran church 50 miles away. When the team arrived on-site for the first day, the grounds were already packed with people. “Be calm. … Work hard, share Christ,” wrote nurse Lauren Awe as she reflected at the hotel one night. Come what may, those on the MMT did just that. Patients wait on the grounds of the MMT clinic. The team established a temporary clinic in the former home of the Rev. Ricky and Kim Jacob, who served in Sierra Leone from 1988 until 1993, when they were evacuated because of the country’s civil war. It was hot — African hot. 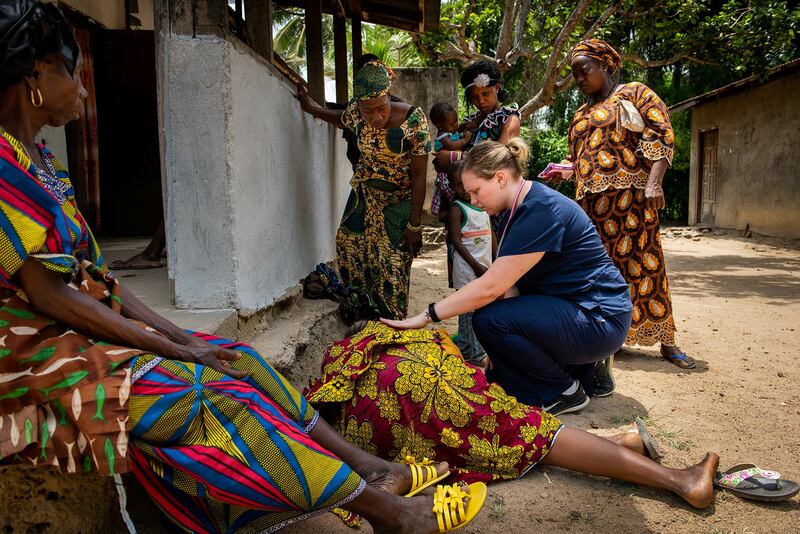 The team saw hundreds of patients and worked through interpreters to communicate in the local native tongues of Kono and Krio. Patients overflowed the registration area. Many complained they couldn’t be seen. The day, according to one team member, was “disorganized, difficult to manage.” Over five days, Ngaujah withstood barrages of insults and accusations because he refused to show favoritism for any reason save the severity of the medical condition. Without his presence, the clinic would have dissolved into chaos. 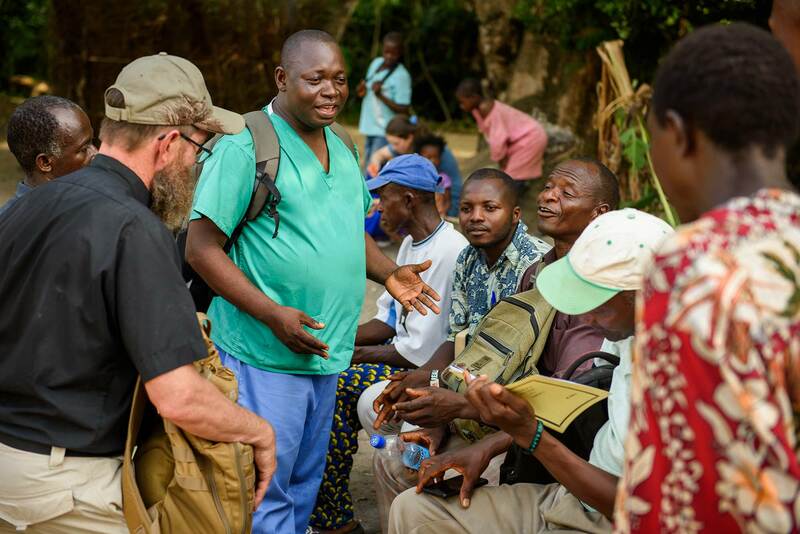 Stephen Ngaujah, a local pastor and trained nurse, spends time with fellow pastors after a day at the clinic. Below: Nurse Donna Mulholland listens to a patient and the interpreter. Each evening, the team was tired and hungry. Nurse Lauren Awe checks on a patient outside the clinic doors. 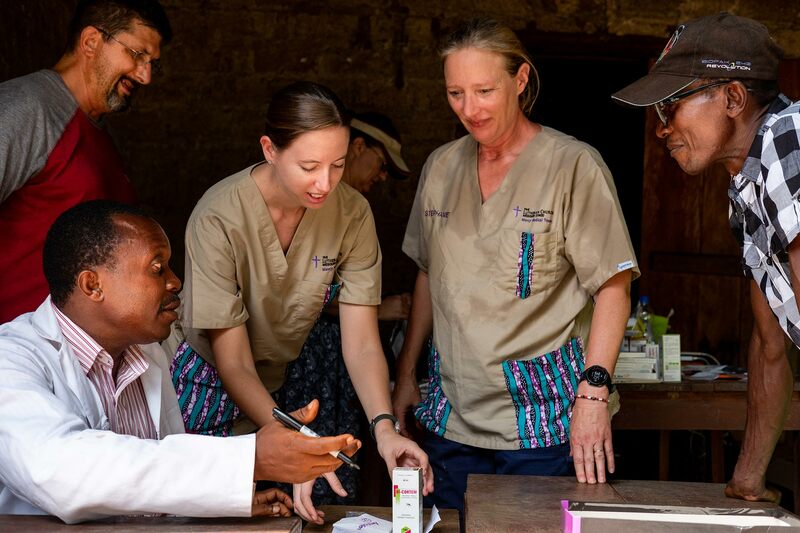 Below: Francis Lahai, a pharmacist from Sierra Leone, works with LCMS missionaries (from left) the Rev. Douglas Thompson, Molly Christensen and Stephanie Schulte, alongside the Rev. James Yasseh, a pastor with the local Lutheran church in Bo. Yet as the week progressed, so did the team. 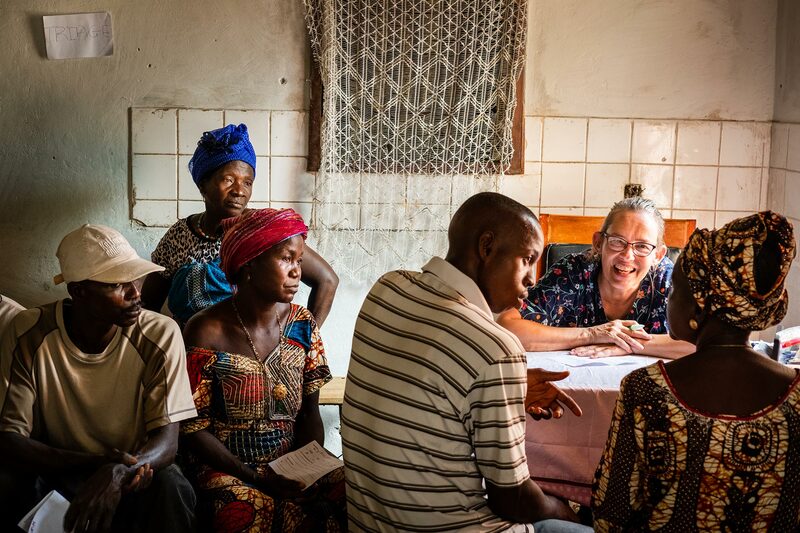 “Teamwork makes serving together a joy,” noted missionary and nurse Molly Christensen. Later in the week, she summarized the experience as “dedicated workers serving and doing our best. Happy, thankful patients.” After the clinic closed for the day, Concordia University, Nebraska, student Hayden Rensner made friends with local children. By Wednesday morning, the travails to survive Africa gave way to the anxiety and hope for the day to come. There was a noticeable calm-before-the-storm feeling in the clinic. During the day, a patient came in with infant twins. “Babies … many very sick with high fevers. Concerned mothers seeking help and hope for relief. How very precious to hold these little ones with a silent prayer for God’s protection and care! So many people expressing ‘Thank you!’ in words and motions,” reflected Hartmann. A patient smiles at nurse Bonnie Hartmann as she’s helped to the waiting area. 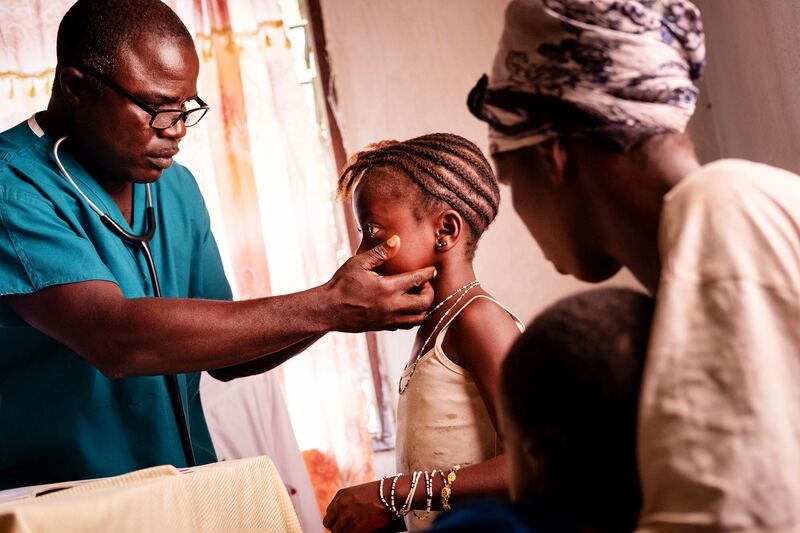 Below: Michael N’Danema, a Sierra Leonean medical professional, examines a young patient. A man walked in wearing a Michigan baseball cap. He needed treatment not for his missing hands, but for a recent bout of malaria. The man was a victim of the country’s devastating civil war. Yet his needs — like those of the people around him — are not historical. They are real and present, bearing scars from the past civil war and Ebola outbreak. It was for these that the team came. By Thursday evening, many in the team felt they had hit their stride. The interpreters and local medical workers were on the same page. The Rev. Daniel Mulholland talks with children about Jesus. One day of peak efficiency. That efficiency gave team leader Rev. Michael Awe the ability to sit with Fatmata and teach her that she was not being cursed by Allah. 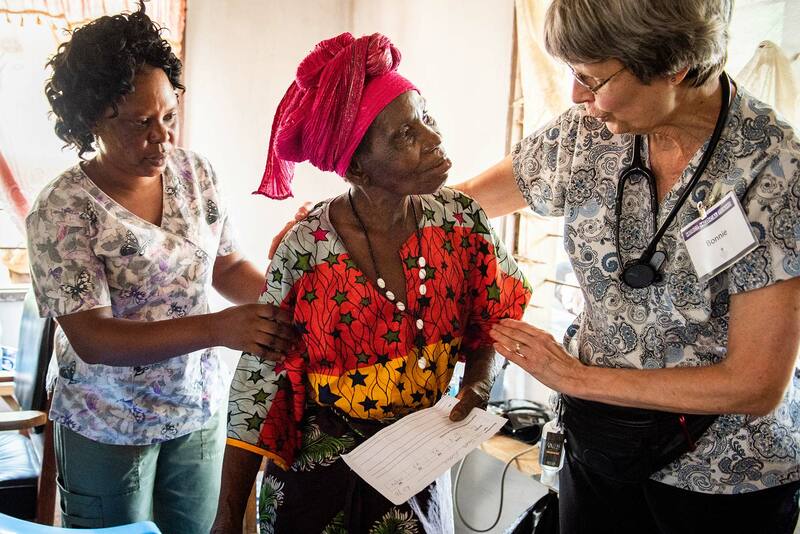 While the team saw other patients, Awe shared with her the truth of God’s grace in Christ. 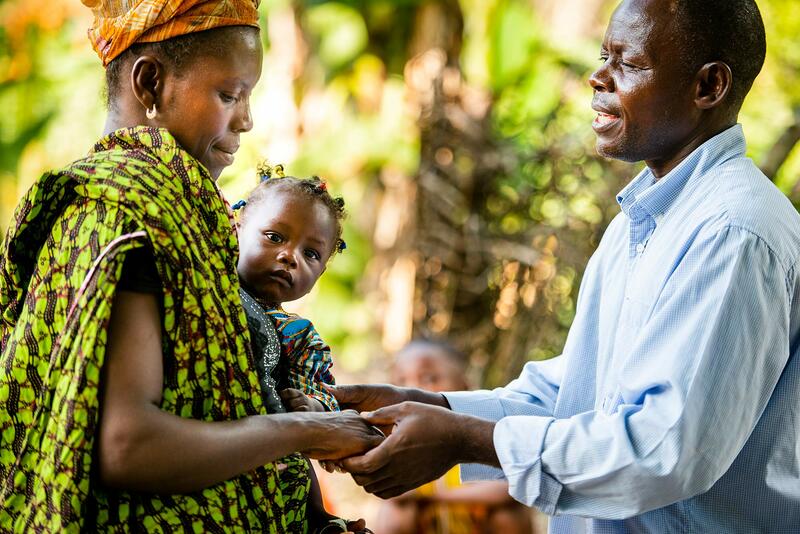 As Sierra Leonean nurse Rugiatu Kamande treated Fatmata’s maladies and also witnessed about Christ’s love, Awe held Fatmata’s hand and prayed for her out loud. Her sister heard the prayer. And Fatmata’s tears flowed with the release from the fear of Allah to the hope in Christ. Overall, 1,450 people were treated during the week. But the MMT is just one small part of the work God is doing through His Church in Sierra Leone. 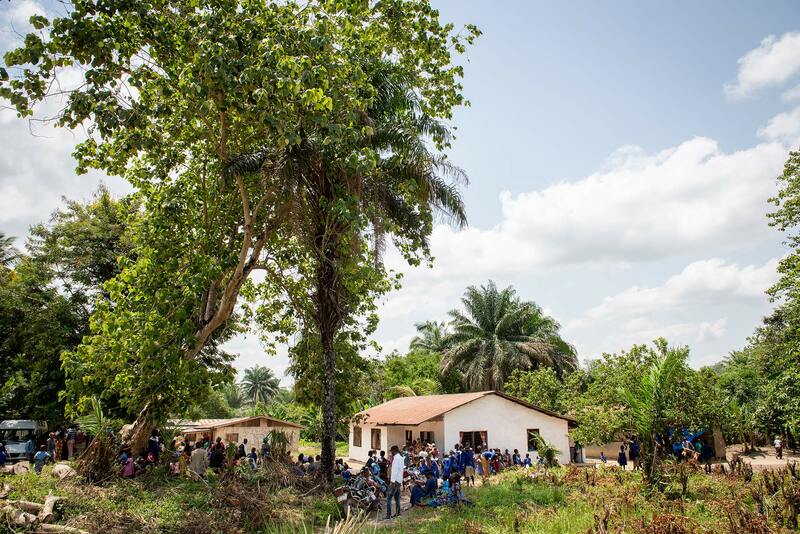 “The opportunity to play a small part in the Lutheran Church of Sierra Leone’s efforts to bring the Gospel of Jesus Christ to their families, friends and neighbors has been such a blessing,” said Stephanie Schulte. The Rev. John Bundor, president of Christ Evangelical Lutheran Church in Sierra Leone, leads a devotion before the start of the clinic. “What a humbling privilege to spend three-and-a-half hours with 29-year-old Fatmata… She needed an IV, a comforting hand to hold and Jesus,” said Michael Awe. “I praise God, through the power of the Holy Spirit, that she left a Christian!” Through it all, Fatmata came in fear and left in love. Fatmata holds the hand of the Rev. Michael Awe as she receives an IV. 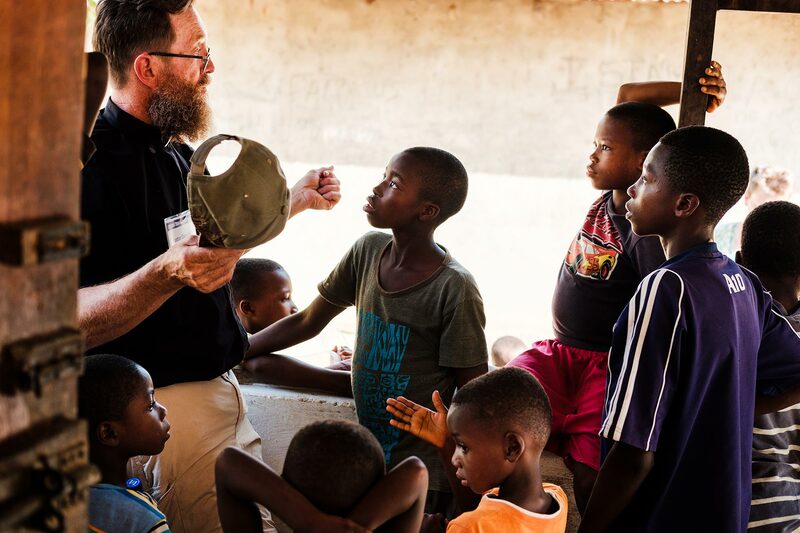 “Even though I may not be able to see the people of Yardu again, I know that I can pray for them and that despite their spiritual and physical needs, God has been holding them since before they were born, and He will continue to hold them,” said Rensner. The church in Sierra Leone works every day to share the love of Christ through His Word and Sacraments. 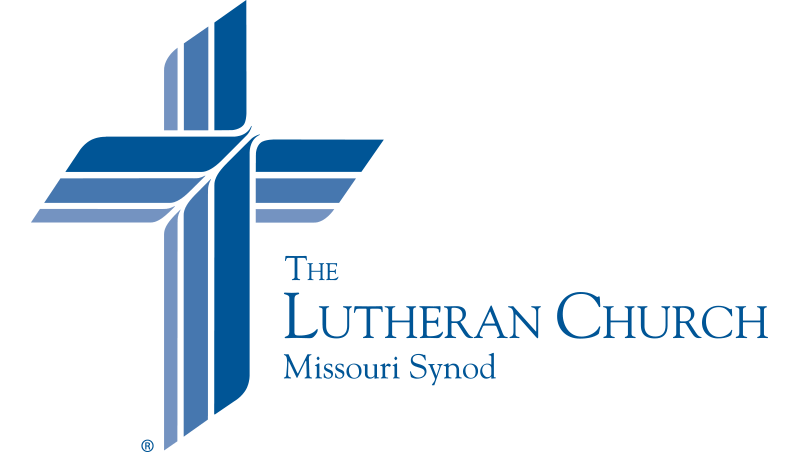 The MMT and LCMS missionaries assist this good work. Pastor Nathaniel Sahr Abu prays with patients following their treatment and pharmacy visit. Our Father, whose mercy is new every morning, we thank You for blessing the work of the Mercy Medical Team as they served in Sierra Leone. May the work done at the clinic and the witness to Your love continue to bless those who heard Your Word. Bless future MMTs, that they might share Your love through their service. 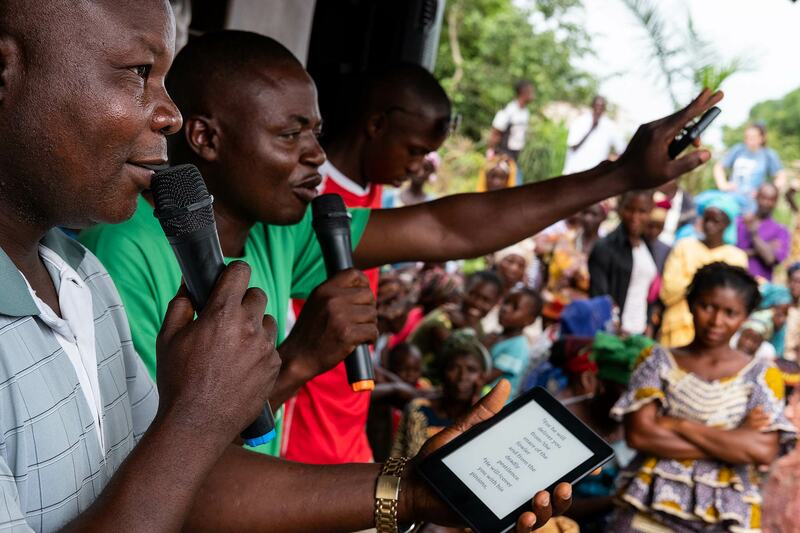 We praise You for the Lutheran church there that proclaims the Good News of Jesus Christ to the people of Sierra Leone. Bless their pastors, teachers and all who gather around Word and Sacrament. Protect those in danger, and bless the outreach to those who don’t know Your Son, in whose name we pray. Amen.